Oops - we don't appear to have a video for the KV-S7075C. Excellent performance keeps office productivity high This speeds up the job of turning even large amounts of daily forms and mountains of documents into data. Clean, crisp, clear scanned data is also ideal for electronic file conversion and management. Books, bound materials, large drawings and other documents that cannot be fed through the Auto Document Feeder (ADF) can be scanned with flatbed scanning. 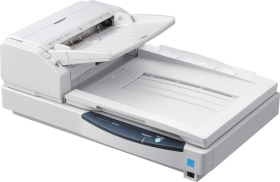 The scanner is also equipped with a Start button, so work efficiency can be increased by quickly scanning while turning the book's pages, with no PC operation necessary. Use the flatbed to scan 2-page spreads from books, magazines, etc., and automatically divide the single image into two single sheets*. Dividing scanned documents saves time and trouble because it makes complex editing operations unnecessary. Save time by reducing the number of scans Place various sized documents on the flatbed and scan them all at once, then crop whatever parts you need. This is convenient for scanning multiple business cards and thick documents. Prevents pages from being missed when scanning Double-sided scanning of documents from business-card size all the way to A3 can be done with a single scan. Plus, double-sided scanning is done at the same speed as single-sided scanning. This eliminates the work of pre-sorting, and prevents pages from being missed when scanning. Documents of different types can be scanned one after another Documents with different sizes and thicknesses can be fed together. They can be center, right or left justified. By using left or right justification, there is no more need to spend time organizing documents according to their size, so scanning is fast and easy. This function greatly increases your productivity. You can enjoy smooth scanning by aligning either the right side, center or the left side of the documents. This lets you simultaneously set various sizes of documents for scanning. The highly reliable paper feed system lets you scan long size documents. This is ideal for scanning electrocardiograms (EKG) or other special documents. This single scanner handles a wide variety of applications. This double-feed prevention roller system is used to ensure reliable scanning of large amounts of documents. It reduces double-sheet feeding by separating the documents from the second sheet onward.